If you have lost one or more teeth because of decay, gum disease or injury, you not alone. It is a problem that millions of people deal with every day. Unfortunately, the situation can affect the way you speak, eat and smile, and even the way you feel about yourself. 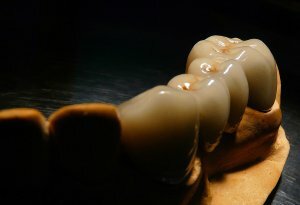 For many years, removable dentures or permanent dental bridges were the only realistic solution for correcting missing teeth. But now, dental implants are another option, offering patients a stronger, more natural-feeling and natural-looking choice. Because dental implants are permanently fixed in place, they will not move around like dentures can. Dentures lack stability because they sit on top of the gum line, slip and create spaces that cause clicking when talking or eating. Dentures also make chewing difficult, which can lead to nutritional deficiencies for some patients. When a tooth is removed and not replaced, bone stimulation stops at that particular site. Because the portion of the jaw bone that had anchored the tooth in the mouth no longer receives physical stimulation, resorption occurs. With dental implants, the process of resorption is avoided because the implant actually functions as a natural tooth root. Dentures provide no such protection against jaw bone deterioration because they sit on top of the gums, rather than integrating into them. Dentures need to be removed from the mouth for cleaning, but the permanent teeth secured to dental implants can be cleaned in the same way as your natural teeth. This means that you can keep the same brushing and flossing routines that you have used throughout your life to keep your teeth clean. The dental implants are made from titanium (a biocompatible material accepted by the body), which means they are stronger than the synthetic plastic resins or porcelain used to construct dentures. Dental implants are much less likely to break or chip. Discussing Dental Implants if you are unsure whether dental implants are right for you, contact Prestige Oral Surgery today at 732-297-7000.